Why have customers when you can have FANS? Think Like a Rock Star explains how to apply these lessons to develop advocates of any type of brand, who will increase profits and grow your business. It also identifies easily replicable marketing strategies of top brands, such as Dell, Ford, Patagonia, and Red Bull, that have successfully turned customers into loyal fans. It is an indispensable tool for any marketing professional. 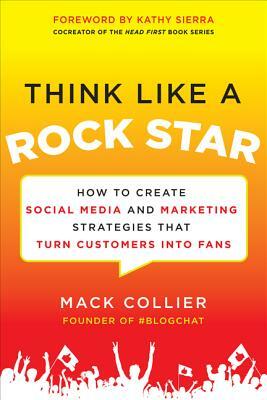 "If you're ready to take the plunge and commit yourself to building a better business, together with your customers, then Think Like a Rock Star is your guidebook to achieving it Simple, jargon-free, and true to Mack Collier's authentic style, this book explains exactly why your brand needs fans and not customers, and how you can turn your most enthusiastic ones into powerful brand advocates. Mack delivers his passion for brand advocacy, knowledge of customer-centric marketing, and in-depth understanding of what makes the most devoted of fans tick in language we can all relate to." "Fun to read, Think Like a Rock Star is guaranteed to give you numerous A-ha moments that will inspire you to do better. By the end of this book, you'll be thinking of marketing and engagement strategies from the viewpoint of a fan, and you'll know what you need to do to connect with them." Mack Collier is a social media strategist, trainer, and speaker who specializes in helping companies better connect with their customers and cultivate fans for their brands. His clients include businesses of all sizes, from sole proprietorships to Fortune 500 companies.